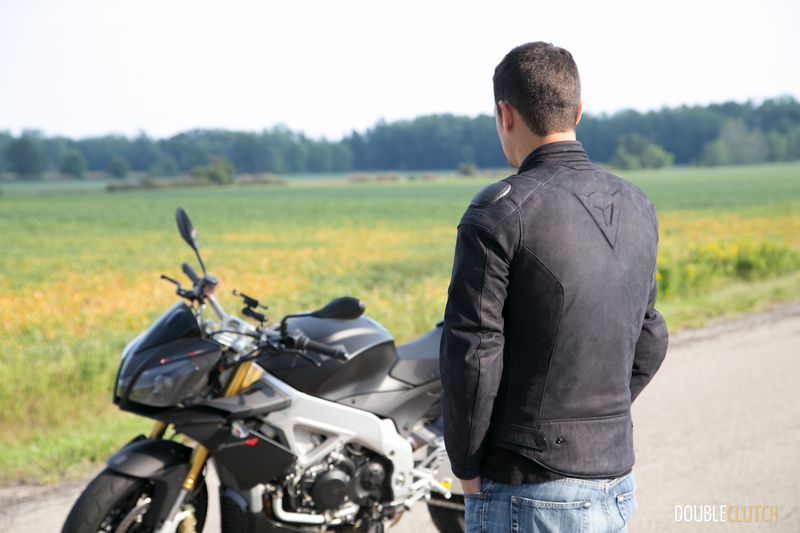 The Dainese Street Rider Pelle leather jacket is a stunning standout in motorcycling fashion. Since 1972, Lino Dainese has actively sought to make motorcycling safer through the protective gear created by his namesake company. 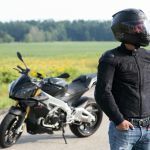 Most typically associated with high performance, track-ready leathers worn by the likes of MotoGP legend, Valentino Rossi, the Dainese catalogue of leather jackets is largely dominated by bold branding on obvious battle armour. 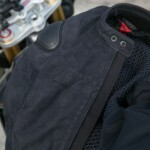 Many of the recent designs, however, have started to better cater to the popularity of the café racer fashions. Unique amongst all the designs is the new Street Rider Pelle leather jacket from Dainese finished in a luxurious suede cowhide. 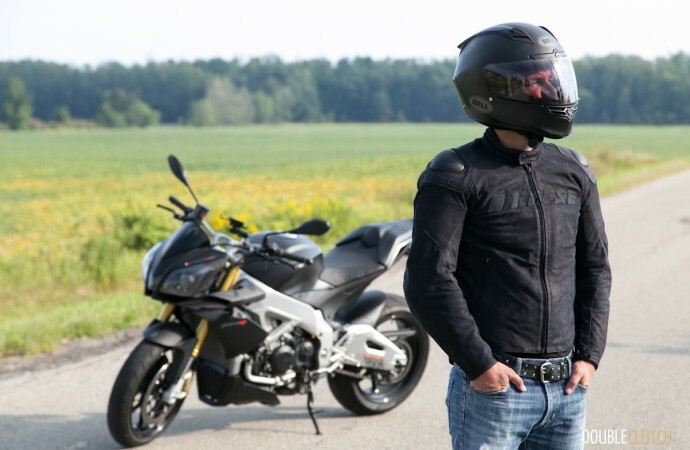 The rich and heady leather smell of the Street Rider almost makes it worth the cost ($679.95 if ordered directly from the Dainese website), but it’s the styling that really stands out. Surely the folks at Dainese would like you to know that you don’t need to ride an Italian bike to appreciate their products – but they do seem to look even better when paired with them. 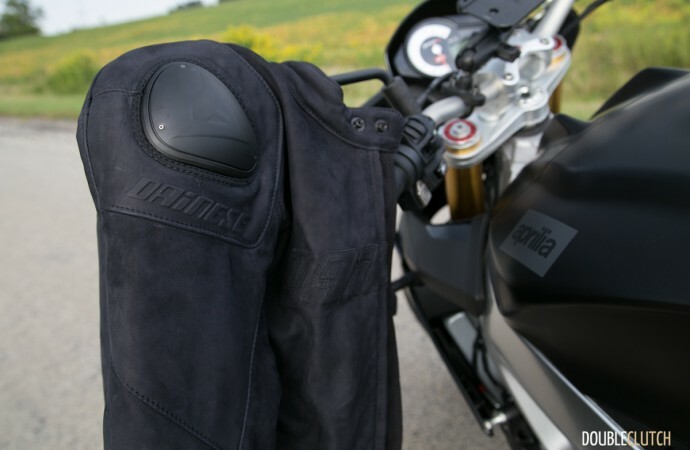 The Street Rider jacket, thanks to its suede finish and black-on-black subtle branding stitched across the chest is just as well suited for riding a Moto Guzzi V7 Racer to the local fair trade coffee shop as it would be ripping up the back roads atop an Aprilia Tuono (as we did). As fashionable as the Street Rider is both on and off the bike, it never neglects the Dainese mission of keeping riders as safe as possible. That’s why the Street Rider comes with aluminum shoulder caps, plus integrated composite protectors on the shoulders and elbows. These high-density, polyethylene foam protectors are certified to the EN 1621.1 standard. There are also pockets to accommodate both Dainese double chest, and G1 or G2 back protection that can be purchased separately. Our Street Rider jacket is not perforated, nor does it allow for venting or a removable liner making this a mild weather piece ideal for shoulder season riding and evening rides here in most of Canada. A perforated version is also offered at the same price point. 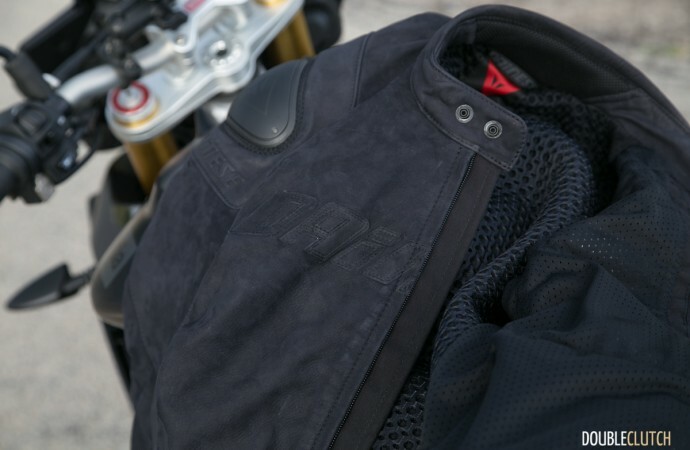 Dainese fits the Street Rider with jacket-trouser attachment points, elasticated waist adjustment, collar adjustment with snap closure and two internal as well as two external pockets. 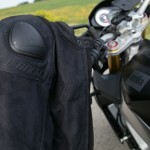 Although the Dainese website suggests the Street Rider is not a slim fit jacket, when ordered in the same size I wear in a suit jacket, I did find the Street Rider to be a little snug, and also short in length. If you can try on your Street Rider before buying, you’d be wise to do so. The Dainese Street Rider Pelle leather jacket is a stunning standout in motorcycling fashion that gives up nothing in off-track riding protection. If you’re shopping for a stylish new leather jacket, the Dainese Street Rider Pelle – in either black or brown – is well worth a look.